Directions: Take Exit 213 off I-75; go East 1.6 miles on University Pkwy into Lakewood Ranch. Make a right unto Business Blvd then left onto Professional Pkwy East. Professional Pkwy turns into Paylor Lane. 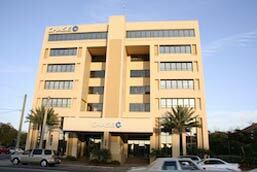 The building picture below is also the headquarters for NCCA. We are housed in the same building. Directions: Located conveniently at the corner of Fruitville Road and N. Washington Blvd in the Chase Bank Building, Third Floor. Directions: Take US-301 N/N Washington Blvd, continue to follow US-301 N, turn left onto Manatee Ave W, turn right onto 9th St W, continue onto FL-45 N/US-41 BUS N/8th Ave W, and turn left onto 4th St W, the destination will be on the left. The offices are open from 10:00 a.m. and the last appointment available is 8:00 p.m.
Clients are seen by appointment only. Call 941-376-9355 to schedule an appointment. Every attempt is made to meet the needs of our clients. All of our therapists are dedicated professionals and enjoy their profession. Cancellations require 24-hour notice or session fee applies.